But then Gregory proceeded to interview Schumer alone, let him go, and then interviewed Norquist. This is almost exactly what happened with the two opening guests on the program last week as well. If the producers have decided they will get better material by doing sequential interviews, fine. I disagree, but that is their call. But I cannot understand why the producers give the audience all these visual cues that contradict what is about to happen. One caveat, as I wrote last week, if this is a case where the interview participants have refused to appear together, then the audience should be told. Otherwise, tell us who the first guest will be and perhaps give a teaser for the second guest. But don’t mislead us. In the sequential interviews, Schumer said the president’s desire to extend the payroll tax holiday will be the first item on the Senate’s agenda when they reconvene this week. The benefit would be paid for, he says, by a surtax on incomes of over a million dollars. Gregory pushed Schumer on the need for entitlement cuts. Schumer says Democrats on the super committee did put those kinds of cuts on the table, but saw no movement on the other side. Schumer ended with a prediction that the type of deficit reduction outlined in the Simpson-Bowles plan might be the ultimate answer for the current impasse. Next up, Norquist. When asked about his philosophy, he said every time the Democrats have raised taxes and promised cuts, spending has gone up. His overall point is that any kind of tax increase acts as a drag on economic growth. And he expressed his pleasure that all of the leading GOP presidential candidates (except Ambassador Huntsman) have signed a pledge not to raise taxes. In the roundtable, topic one was the endorsement given former Speaker of the House Newt Gingrich (R-GA) by the New Hampshire Union Leader this morning which makes Gingrich the current front runner in the “not Romney” part of the Republican presidential race. Rich Lowry of the National Review warned that Gingrich is like Saturday Night Live’s MacGruber character in that he always carries an explosive device with him, and that device is “…his propensity to say things which are incredibly impolitic.” But if he can get through the next six weeks and win Iowa, “He is now set up for a hell of a run,” says Lowry. The roundtable gave a brief shout out to former GOP presidential candidate Mike Huckabee (R-AR) for the potential importance of his endorsement (along with that of former Governor Sarah Palin [R-AK]) to one of the current candidates. At this point the camera cuts to Rich Lowry who had an “I-can’t-believe-he-just-went-there” look on his face. 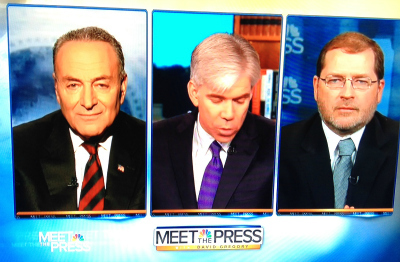 David Gregory seems not to notice and cuts to the commercial break. After the break, Gregory tries to carry on with the show’s usual format, but Lowry did not play along. He went back to Dyson’s comments and said that Herman Cain is a Tea Party hero with supporters showing no “racial anxiety.” Dyson says Cain has held contradictory positions on the role of race in this contest. Lowry clearly has more to say, but time is out. Gregory says, “Sounds like we have a whole other program there,” and closes the show. I think carrying on this discussion between Lowry and Dyson would be a perfect use of Gregory’s new, mid-week Press Pass feature. But I hope he interviews the men together, not sequentially.